The original parish of St. John's Church, Surrey Road was carved out of the parishes of St. Peter's, Bournemouth, and Kinson, and was known as St. John's, Kinson. 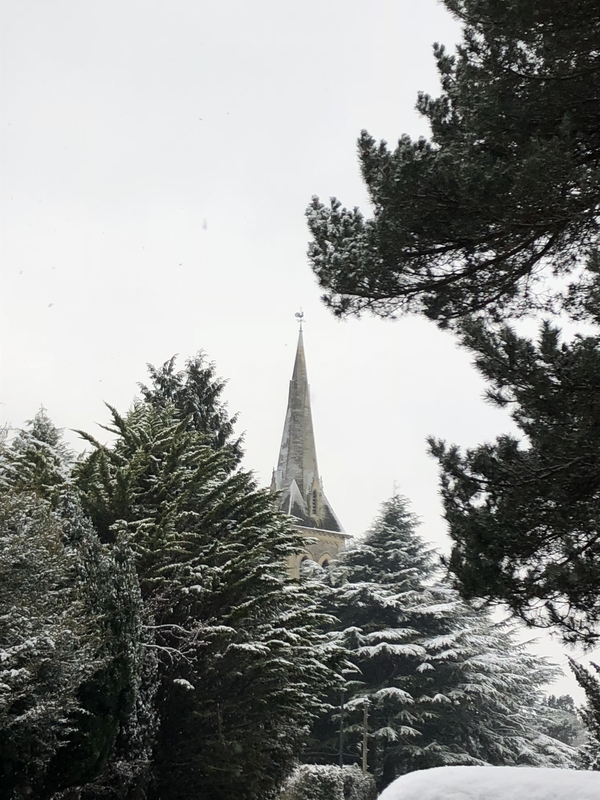 The building of the church was begun in 1889, on a site given by Miss Durrant (owner of the Branksome Estate), who also paid for much of the work. The architect was Mr. T. Stevens, FRIBA. Most of the church was finished by 1898, and on 18 November 1898 at 3:00pm the church was consecrated by the Bishop of Winchester. The tower was completed in 1905-6. It is a "broach" tower, which makes a transition from a square tower to an octagonal spire, and is very unusual in this part of the country. The first stained glass was installed in 1899, in memory of a young soldier who died on active service. The theme for all the windows in the church is the Te Deum. The west windows, built by Messrs. James Powell in 1910, are almost exact replicas of a window in Liverpool Cathedral by the same firm. As well as its stained-glass windows, the church is made beautiful by the tiled mosaics laid into the floor and walls of the chancel and chapel. The first bell was installed in 1898, but the other 7 were not installed until 1906. The organ and clock date from 1899, and the font dates from 1923. The ironwork inside and outside the church was made by Caslake of Bournemouth. The amalgamation of St. John's parish with St.Michael's parish was first put forward in 1974, but did not happen until 1983-4. St. John's Centenary Year was celebrated in 1989. In 2005 major work was completed to provide a disabled toilet, a fully fitted kitchen and a creche/lounge area. A new dais was built and the font was moved to a position at the front of the church. Source: "The Parish Church of St John the Evangelist, Surrey Road, Bournemouth: The First Hundred Years" by Kay Cope.